VaporFi has been very busy in 2016, releasing tanks, mods, E-Juices and starter kits left, right and centre. Today we’re taking a look at the VaporFi VEX 150 TC, a new, high-end mod that has pretensions of taking on — and beating — some of the best box mods in the business. The VaporFi VEX 150 TC is also completely different to anything VaporFi has ever released before, which makes it special — for VaporFi, as a release, but also for reviewers and consumers like you and I.
VaporFi products are pricy and this, on occasion, puts some users off. But it really shouldn’t. As with most things in life, once you understand why something is a certain way you get a broader, more enlightened perspective on things. 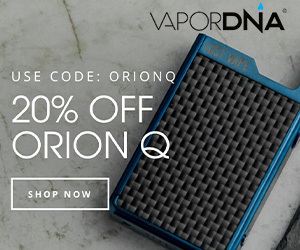 VaporFi products are design and built in the US by people from the USA. They don’t use cheap labour or OEM factories in China. Everything is done in the good ol’ US of A. So when you scoff at the price, put it in context: you’re helping to boost the economy, pay someone’s wages and support the US vape market in general. The other reason VaporFi stuff is expensive is more simple: it’s premium as hell. All components are honed from the best possible build materials and everything is engineered and QC’d to the highest order. And this results in flawless performance, design and aesthetics. VaporFi has some really nice packaging and the VaporFi VEX150TC is no different. On the cover of the famous VaporFi’s green and white box we have the Vex 150 TC pictured alongside all the usual branding. As we open the box we are presented with the Vex 150TC, supported very well by foam. Underneath the device is where the USB cable is along with the manual. Very simple presentation but it works; everything arrived in perfect condition with zero damage to box or its contents. 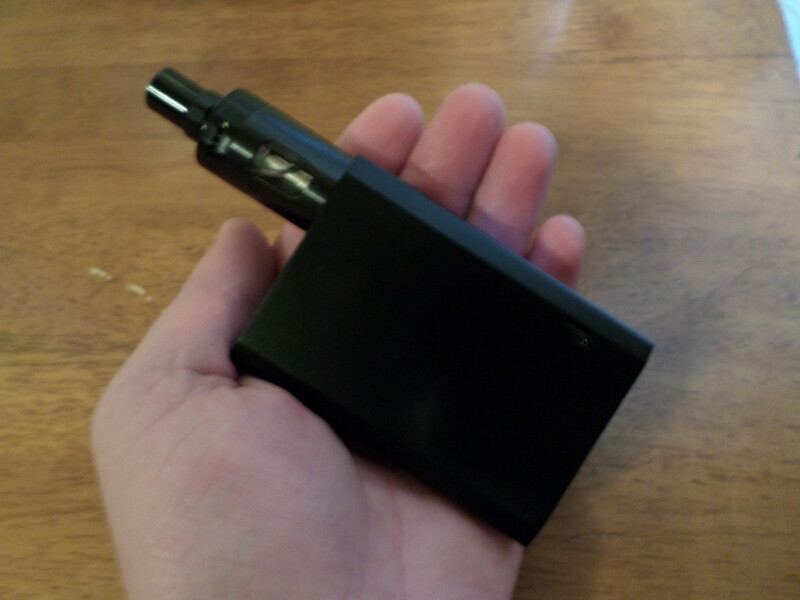 The Vex 150TC is a bit on the wide side but fits nicely in the hand. The overall quality is here on the Vex 150TC, not a single error in manufacture at all. Everything sits flush together and the finished result looks utterly sublime. I don’t really know what VaporFi’s designers have been smoking in 2016/17 but whatever it is I think they need more of it! The company produced a lot of awesome stuff in 2016 and this mod is easily one of the finest. It looks and feels utterly premium. No sooner than you unbox it, you know where all that extra money has gone. Everything is machined perfectly and the result is a solid, reliable mod that looks simply stunning. The 510 connection is spring loaded and the threading is very nice and smooth. Here is where I have to be blunt: the Vex 150TC is 22mm thick and that certain RDAs do not sit particularly well on top of it. This isn’t a deal-breaker by any means but it is certainly something to keep in mind before purchase. For the record: I’m OK with it. 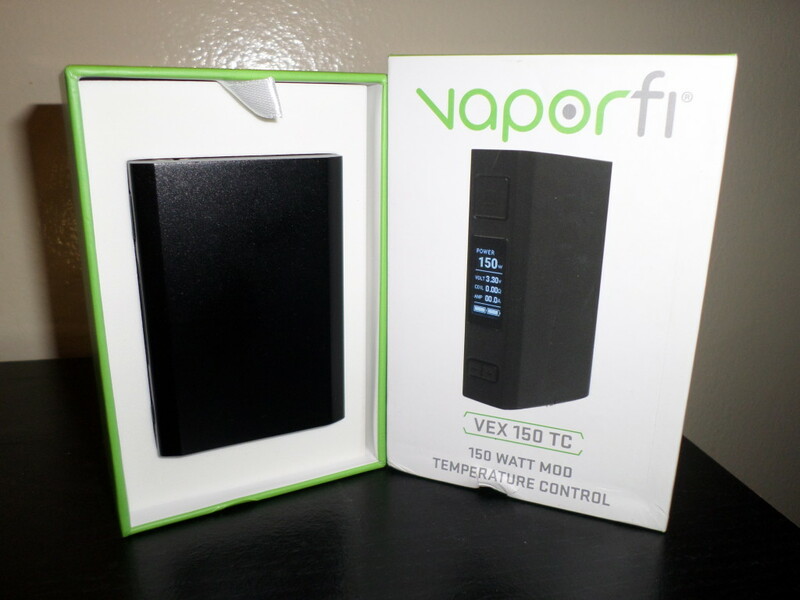 The bottom is a great place to look at this device, as VaporFi has now given the consumers a device that is 150W TC mod that is powered by removable 18650 cells! The battery door works great and is made to last. 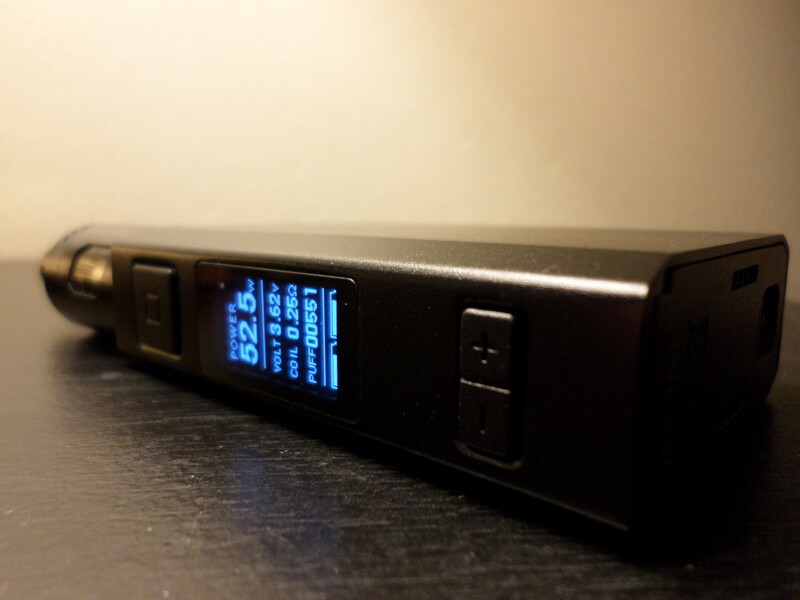 The batteries slide in and out of the VaporFi Vex 150 TC with ease, so no tearing of the battery wraps. 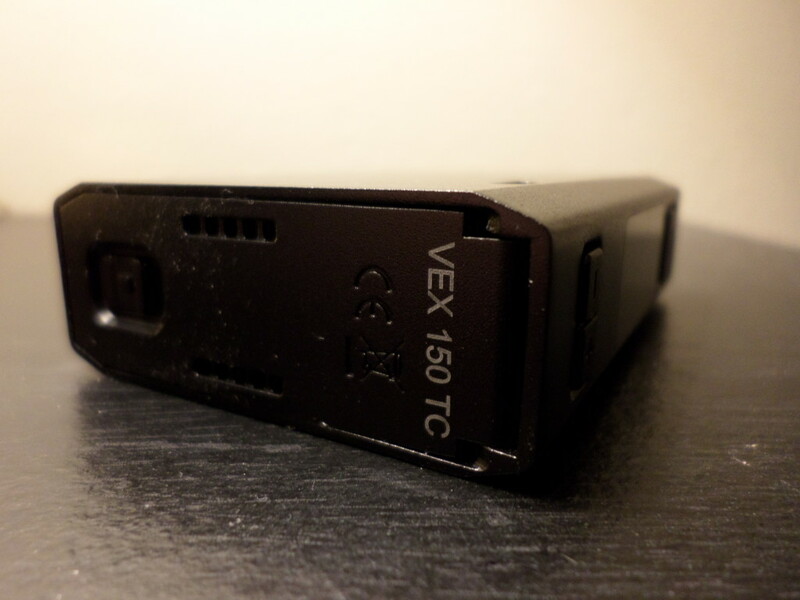 Battery venting holes are found on the bottom the the Vex 150TC right on the battery cover and are sufficient. 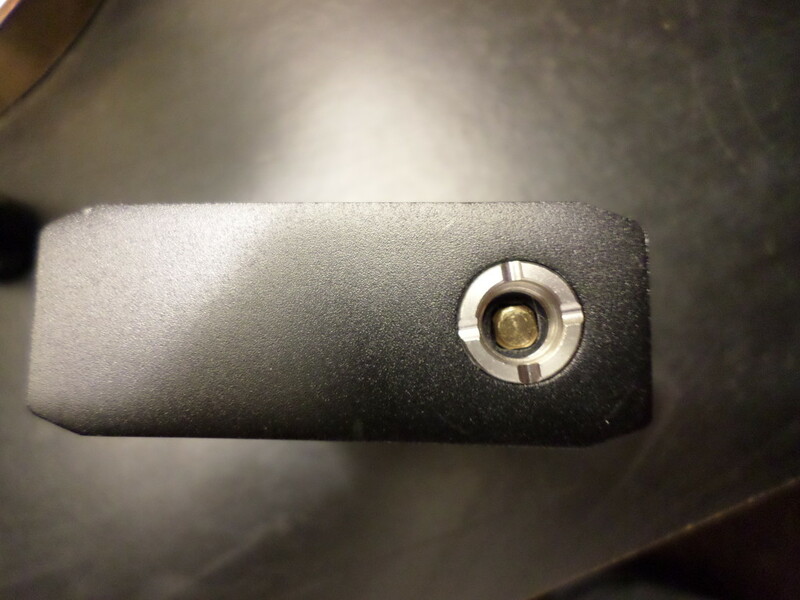 Now, here is perhaps the best part about the VaporFi Vex 150 TC device. Not that the removable batteries isn’t great but I feel this is just better. On the front of the VaporFi Vex 150 TC we now have a wonderful 0.96” OLED Display which is bright, crisp and clear — a truly stunning thing to behold. The Vex 150TC handled EVERYTHING I threw at it during my testing phase. 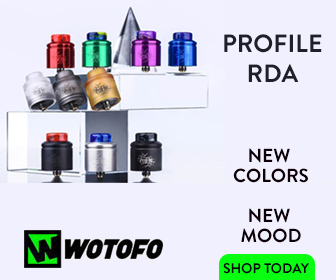 Everything from RDAs to RBAs and sub-ohm tanks. First I used my Troll V2 RDA with dual claptons clocking in at a smooth .25ohms. I put a fresh set of cells into the Vex 150TC and cranked the wattage up to 55W and darn near instantly fired the coils up, like about half of a second. That’s really good considering the build I have. So, I ran this Troll V2 up to 150W and the Vex 150TC never sagged or faltered. The Vex 150TC never got hot and it fired every time I wanted it to. Adjusting the wattage is simple and easy. Going into the menu system is a simple three clicks of the fire button, using the adjustment buttons to move around, and finally using the fire button to make your selection final. I also run a sub-ohm tank, the LYCHE by Eleaf, and the Vex 150TC gave the same awesome performance, firing every time, no sag in power and, best of all, it never got hot. 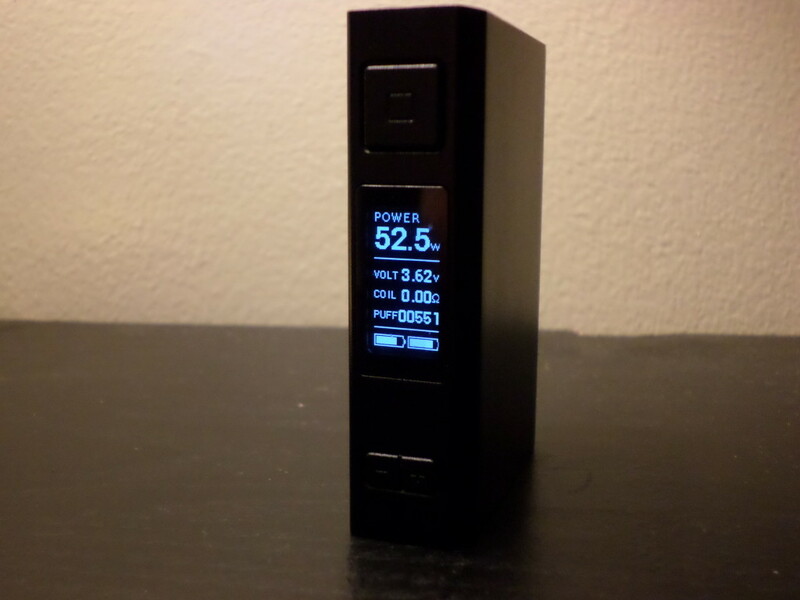 I do have other devices that I did compare the VaporFi Vex 150W to in terms of power, such as the RX200S and the SMY SDNA 200. At 150W the Vex 150TC matched with the RX200S spot on, the SMY SDNA 200 was slightly better as the DNA chip gives 97% accuracy. Basically, the Vex does what it’s advertised to do. But wait, does the Temperature Control work? Yes it does, works very nicely. I ran a Ni200 coil, SS316, and a Ti coil. All of them I ran till the tank was dry and kept vaping until either I burnt the coil or the coil dried out from vaping. Did any of the coils burn? Not a single one did, TC works as intended on the VaporFi Vex 150 TC. I used Samsung 25R5 (green) in the VaporFi Vex 150 TC and using my RDA at a steady 90W the Vex 150TC gave me almost a day and a half of moderate to heavy vaping. I charged my Samsung 25R5’s and then ran the LYCHE tank by Eleaf at 50W and the Vex game me almost two and a half days of moderate to heavy vaping. The Vex 150TC does not drain your cells. 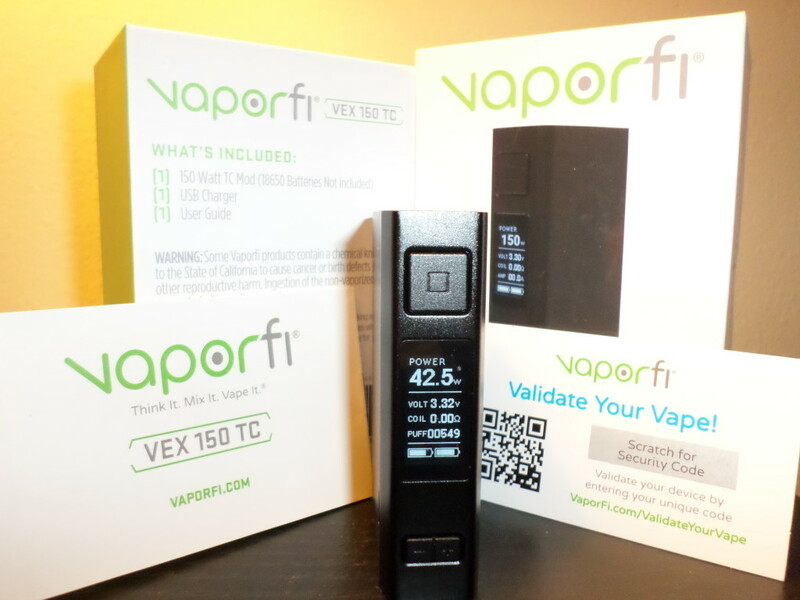 With quality, dependability, innovation and a great customer service and support I am pleased to see VaporFi come out with the Vex 150TC, as it tells me that VaporFi are listening its customers wants and needs. If you want quality, reliability, dependability and class, you NEED to check out the VaporFi Vex 150 TC. It is a stunning mod in almost every regard. Easily one of the best I’ve tested in the past 12 months. Bar none.